The Lower Modernisms – 004. Introducing Matchbook Delight! Curly Jones Family Restaurant. February 6, 2011 by James Black. The idea for this series came from the “Philately Fridays” series on Mike Davis’s blog, “So Much Pileup: Graphic design artifacts and inspiration from the 1960s – 1980s.” Davis regularly posts images from his collection of Modernist stamps. His stamps are so cool that at first I had an urge to start a stamp collection. But then I realized I didn’t need to, because all the good stamps already belong to Davis and he is generous to share them with us; and then I remembered that I already have a collection, of awesome matchbooks. Matchbooks present to the graphic designer a perfectly self-contained design problem. The small and standardized size quite literally constrains the designer’s scope, and presents a level playing field – when it comes to designing nice matchbooks, the biggest corporation with all its money has no intrinsic advantage over the mom-and-pop coffee shop. By studying these matchbooks closely, we can enjoy them as well as tease out what techniques the designers used to impart that characteristic lomo style. 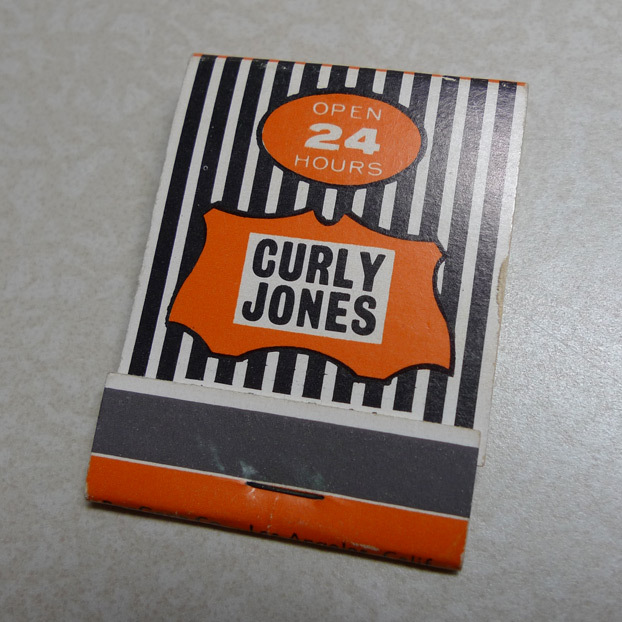 Today’s matchbook is from a 24-hour family restaurant called “Curly Jones.” The front features the Curly Jones logo in orange with black outline. The shape of the logo seems at first to be a representation of a wooden sign shape with some traditional curlicues, but it is slightly asymmetrical, giving it an uncharacteristic jauntiness, and evoking the true inspiration for this shape – it’s a cowhide! The international orange is striking against a field of black and white stripes. The black stripes are about twice as wide as the white stripes in the field – I don’t know why it is better this way, but I have faith that the designer knew what he or she was doing. 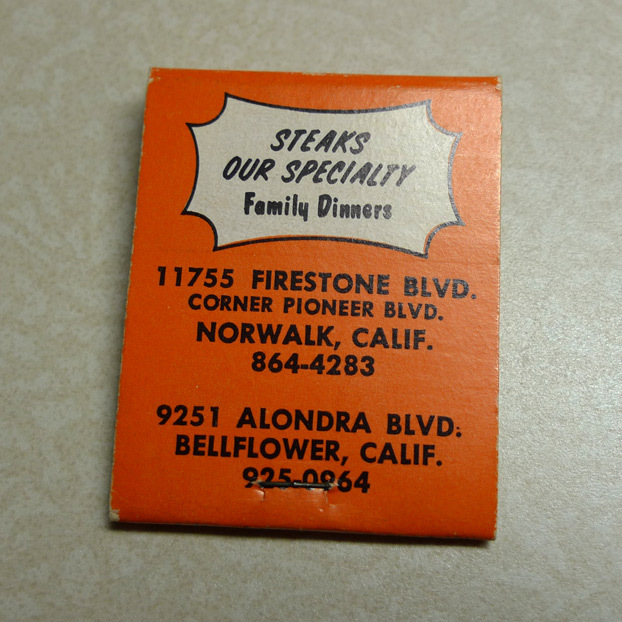 On the reverse, we learn that steaks are the specialty at Curly Jones – hence the cowhide-inspired logo. Here the color scheme is inverted, with a black-and-white log on a field of orange. The designer appears to have been obliged to print in two colors only, black and orange on a white card stock, and worked within this constraint. The Starburst-Pincushion shape on the reverse recalls the cowhide-wood sign shape on the front, but conveys a completely different tone – the shape conveys a sense of bursting, of eye-catching and attention-grabbing. The all-caps, slanted “STEAKS OUR SPECIALTY” contrasts with the title-case “Family Dinners”. The effect on the message’s tone of this contrast is hard to describe, but the “STEAKS” conveys masculinity and expediency, while the “Family Dinners” is more accommodating and respectful. Curly was a fry cook at Freddies at the Pioneer & Firestone location in the sixties. He bought that location, opened Bellflower & then opened another in Corona California. I think he was sick many years ago & most likely has passed away. I spent alot of time in both the Corona & Norwalk locations. Mike, thanks for your comment – I’m glad that an original fan of Curly Jones somehow found his way to the blog! But I’m sorry to hear that we have lost Curly. I grew up in Norwalk and Curly Jones was our favorite place to eat. My sister could have lived off their pancakes, and everyone else loved their biscuits and gravy. Our whole family, Aunts, Uncles, Cousins, Grandparents would always gather there when they came into town. When I started dating my now husband, I even took him their many times late at night after a movie. I am out of state now, but man do I miss Curly Jones. I have never met a biscuit and gravy that could compare. I don’t know if you know it or not but the gravy was made with coffee added to it. I lived next door to Ross(the owner) in bellflower, CA. Fantastic. I’ve been enjoying your blog today, James! So cool that there has been traffic from fans of Curly. Me and my pals would frequent this joint after punk shows in the late 90s. I recall the night my homie Jay-Are broke the record for most biscuits and gravy consumed in one sitting! He took down 17 of them bad boys! There was 6’5″ server/cook working that night, who commended my friend on his endeavor! The new location is cool and all, but nothing like the old school ghost town saloon look of the former. Curly Jones was one of the two “go to” restaurants for my family in the sixties (remember Bojax?). As a kid I was very impressed by the ghost town saloon look, there was more of that look west on Firestone close to the Jack in Box. “Dodge City”? Good memories,good times,good food.